Taking the ‘Smart Search. Made Simple’ concept to the next level by turning our media space into a simple flight search. Searching for flights to the next sports, music and arts events just got as easy as dragging an image. The proprietary technology combines various data sources such as; image search APIs, ticket platform APIs, location APIs and Cheapflights’ flight search API. The user drags and drops an image onto the Cheapflights banner, which captures and analyses it, then feeds the detailed content description of the image to multiple service APIs to establish if the photo shows a singer, actor or sports star. This information is then fed to ticket sale services, such as Ticketmaster or Songkick, to find out when and where next public event is taking place. 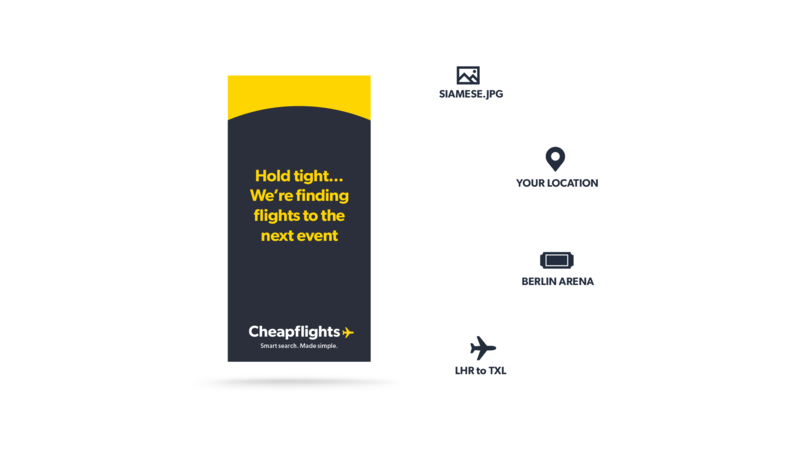 The Cheapflights API is then used to search for the best flights to that event from the user’s location (which is determined by a location API). Flight search results are then sent back and displayed in the banner within a few seconds.